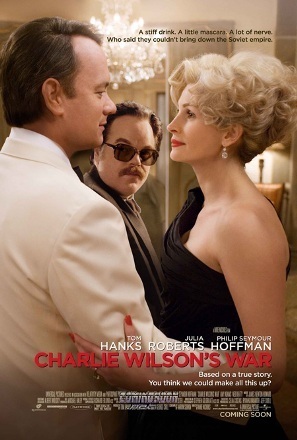 Charlie Wilson's War is a 2007 biographical drama film based on the true story of Democratic Texas Congressman Charlie Wilson, who conspired with "bare knuckle attitude" CIA operative Gust Avrakotos to launch Operation Cyclone, which initiated and organized the Afghan Mujahideen in their resistance to the Soviet occupation of Afghanistan. The film is adapted from George Crile's 2003 book Charlie Wilson's War: The Extraordinary Story of the Largest Covert Operation in History. It is directed by Mike Nichols, written by Aaron Sorkin, and stars Tom Hanks, Julia Roberts, Philip Seymour Hoffman, Amy Adams, and Ned Beatty. It was nominated for five Golden Globe Awards, including "Best Motion Picture", but did not win in any category. Philip Seymour Hoffman was nominated for an Academy Award for "Best Supporting Actor". The film was originally set for release on December 25, 2007; but on November 30, 2007 the timetable was moved up to December 21, 2007. In its opening weekend, the film grossed $9.6 million in 2,575 theaters in the United States and Canada, ranking #4 at the box office. As of March 2008, it has grossed a total of $113.5 million worldwide — $66.6 million in the United States and Canada and $46.8 million in other territories. Charlie Wilson's War received generally favorable reviews from critics. As of January 2008, the review aggregator Rotten Tomatoes reported that 82% of critics gave the film positive reviews, based on 163 reviews. Metacritic reported the film had an average score of 69 out of 100, based on 39 reviews.